The mule was easy to catch today, but I rather suspect that was because I don’t usually work him on Fridays and he thought it was going to be a halter on/halter off/grass scenario. Ha. I took him out for a walk onto the common and he was high energy the whole way. He is really very nervous. I don’t know where this anxiety has come from, but I am working very hard to help him overcome it. Whatever is causing this fear of leaving the property and stepping out into the big wide world is, I’m sure, the reason he is reluctant to be caught. 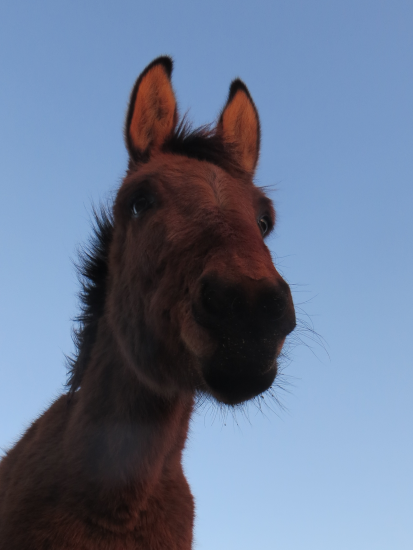 Last week I noticed that he has become quite clumsy and stumbles a lot, which is very unusual for a mule; he was also obsessed with drinking from puddles, particularly the ones found on the waterlogged, boggy ground out in the Punchbowl. When I mentioned the latter to Ben, he suggested that the mule may be seeking magnesium, so we have put him on a specific donkey balancer (which he really ought to have been on already – alas, his owner is an idiot. None of the feed stores round here keep it in stock so we had to order it in specially) and will also be giving him an extra magnesium supplement. I had a vague knowledge that magnesium was used as a calmer for horses, but when I looked into the deficiency symptoms I discovered that they include hyperexcitability, nervousness, muscle soreness and hypersensitivity to being touched. Hmm. Sound familiar? Regarding the stumbling, I spoke to our wonderful EP who suggested that I get a physio out to look at him. When we first got Marty his hooves were fairly long and the toes twisted inwards, and over the past few months his hoof balance has changed significantly as he’s had them trimmed down to their proper shape. I suppose it’s like if you spent all your life walking around in high heels, and then suddenly started wearing flats – they’d be more comfortable, but you’d almost certainly have sore muscles that now had to be used differently. His toes also grow very quickly between trims, so it may be that we just need to keep them filed down ourselves. Anyway, that’s the potential physical problems I’m addressing. As far as the psychological stuff goes, his reactiveness to haltering has more or less been sorted: I’ve developed a new technique for taking the halter off, and he no longer becomes tense or flinches when being handled with it. Phew! Excuse me while I wave my tiny tiny victory flag. I mentioned that, the last time I took him onto the common, we walked past the track where he’d encountered the loose horse a few weeks back and he was significantly calmer once beyond it. Today, I took him down it. Like I say, he was terribly nervous already, so I guess today was either the best time to make him face his fear or the worst time – but it went well, so I’ll go with the former! He planted himself, refused to move, wiggled around and tried very hard to dissuade me from taking that path, but I was gentle yet firm and told him that there was nothing to be afraid of and that we’d face his fear together (as opposed to earlier, when he’d got upset about walking past a shiny black van and I’d halted him and told him to get a grip. That did actually work, though…). The first few strides down it were quite bouncy, but once we turned on to a couple of new-to-him tracks he calmed right down and seemed more interested than flighty. He obviously prefers exploring new places, but practically I can’t take him on a totally new trail every time we walk out. We will need to compromise! I’ve found that when he gets rushy and starts power-walking, which he did quite a lot of today, asking him to halt and then walk on again works really well. I think it interrupts his forward thought and prompts him to tune into me again, because nine times out of ten he will walk on much calmer than he was before he was halted. Asking him for back up is also useful (both of these are techniques taught to me by Ben. It is very useful having an exceptionally good trainer on hand 24/7, and he has to respond to my every whinge and feckless question because he’s engaged to me and thems the rules. HA). The mule has a curious habit of turning his nose in towards my face and looking directly at me while we’re walking. He only does this when he’s very nervous about something. It is quite unnerving to have him staring at me like that, and I discourage it because it brings him too much into my space, but I do wonder if it’s a comfort thing for him. Is he looking for approval and assurance? Or is he contemplating whether or not biting my face off would solve his predicament? Maybe it’s my face that’s making him nervous. Sorry, mulo. We can’t all be as pretty as you. – also I handled everything and didn’t wimp out of doing things just because I was afraid of what might possibly potentially happen. Yes, it’s tiny victory flag time again! Taking the positives out of today, we are now at a place where he is much more inclined to really think about a situation rather than just becoming frustrated with me and throwing a tantrum. 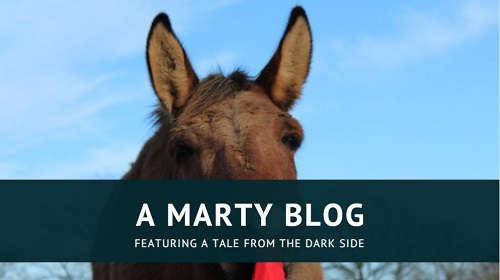 He was never a badly behaved mule and thinking has always been his main forte, but there were times – particularly when out on the common – where he would get overwhelmed and have to jump up and down or threaten to bite me. Now he does his intense face staring instead. Swings and roundabouts, I guess. But hey – it’s still another opportunity for the victory flag. Despite having such an apparently traumatic session with me, he actually left his reward grass and walked right across the field to hang out with me for the rest of the afternoon … which was extremely nice. Yeh, he only wanted scratchies (if I’m there I may as well be doing something useful, right? ), but it still felt good that he chose to be with me over food or his horse buddies. He was very playful and we had a hilarious game of chase around the wheelbarrow, because I wanted to take a photo of him from the opposite side … and he didn’t. He’s a pretty cool guy. You’re doing great!! Loving the blog, so sorry I don’t get chance to comment much but have been really enjoying following your progress. Time and patience will win out and you definitely should wave that victory flag! The more you do together the more ‘together’ you will be. The stumbling is not uncommon at this age, mules mature slowly and the balancer will definitely help along with the walks to build muscle. Dragon had a similar issue a few years ago when we first had her, lots of exercise and balanced diet sorted it quickly. Thank you – no need to apologise, you must be very busy with your family (long and short ears!). 🙂 I know a lot of people think I’m quite weird for taking my mule out on walks, but I firmly believe that the more time we spend together the better our relationship will be. Not to mention it’s just useful to get him used to the sights and sounds of the big wide world before I ask him to handle them with me on his back. 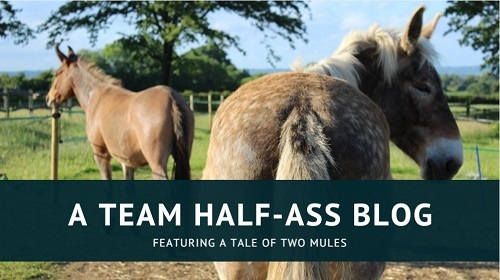 As a fellow mule owner I’m enjoying reading about your progress. The reluctance/anxiety you describe is very familiar. Sometimes with mules it can be genuine anxiety, usually about safety, sometimes it can be questioning your leadership, sometimes it can be reluctance to leave the herd, sometimes it can be just questioning the purpose of what you are doing. Each time you find yourself trying to work out which it is, (and it can be none of the above). My strategy is usually to give my mule a few moments to think about it (not too long as this seems to give him time to get even more worried! ), then a quick rub and turn to walk on again. Usually this works, but if he gets “stuck” then I give him something else to do, either, like you describe, backing up a few steps, or doing a couple of circles, or disengaging his rear end. After this he is usually ready to walk on. Anyhow, please keep writing, it’s great to hear your exploits. Mules certainly teach us about ourselves! Thank you so much for your comment – it really helps to hear that other mules are often the same! I was particularly interested to see your mention of giving your mule a chance to think about it, but not too long to think about it. I’ve learnt to do the same with Marty, although I’m not sure that I’ve quite figured out how long is too long yet. I guess it’s just a case of trial and error. Also interesting to consider that he may be questioning my leadership/questioning the purpose of what we’re doing – the latter makes me laugh, but it is so true! Thank you once again for your comment, it’s been very helpful. I will try circling or disengaging him next time we get stuck, and you’ve also made me think that maybe I should break our walks up by asking for this kind of stuff anyway – I imagine it would create more of a purpose for him, and keep him more engaged, if he had to keep paying attention to me in case I asked for some groundwork. Hey well done with the saddling, and welcome to the lifelong quest to find a saddle to fit Marty. I’ve lost count of the saddles I have tried, all of which tended to end up somewhere around Mr Mule’s neck! Currently I use a Bob Marshall treeless western saddle, but still have to use a crupper to stop it moving forward. Anyway good luck with the search and please keep us all posted with your progress!